When you have a campaign manager for two of the biggest electoral flops in recent Longmont history behind you (Karen Benker and Richard Juday), it’s no surprise that you’ll come across mistakes like this. No one ever said anything about corruption? 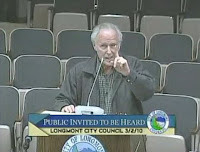 The May 4, 2010 Longmont City Council meeting was full of all kinds of twists, turns, surprises, and laughs. 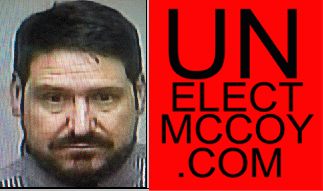 There was also some mass amnesia going on amongst some in the crowd, City Council, and the Election Committee. A self-described “charlatan of limited understanding” tried to plead his case for Longmont to halt the permit process of the HeavenFest Christian concert festival at Union Reservoir. This was the disconnected, fanatical, deranged, lunatic (or fill in your own adjective) fringe at its finest. The video is worth watching, along with the hilarious commentary, which you can see at this YouTube link. The speaker is non-Longmont resident Duane Leise, who is also theregistered agent for “What’s In It For Longmont?“, the LLC that’s currently listed as delinquent with the Colorado Secretary of State, which is ironic in and of itself as these same people were just seen recently picketing a reception for a Secretary of State candidate. The other names in the LLC filing should sound somewhat familiar: M. Douglas Wray, Kaye Fissinger, and Anita Lynch, sort of a who’s who (more like a what’s that?) of the Longmont leftwing scene. LifeBridge Christian Church – where to start, they got their name and reason for existence because of the Union annexation and development. But they couldn’t stop at agreeing to disagree, there was no level they wouldn’t stoop to. This has been written about here and other places ad nauseum, and all they accomplished was pushing a church out of Longmont into the welcoming hands of Firestone with probably lower property taxes (not in Boulder County) and more lenient building codes (like sign height limitations). Rocky Mountain Christian Church – the same hate filled diatribes aimed at LifeBridge were also voiced by these same people in the case of this church’s expansion plans. HeavenFest – they are using every medium available to put a stop to this Christian-based concert festival: their own new website, Longmont Ledger, local radio, city council speakers, etc. Sounds like it’s all for nothing as City Council wont even vote on this and the permit should be issued any day now. I bring the anti-religious angle up because as you see in the video, this crank complains that people have called him an atheist for being against the LifeBridge development. Maybe they have, but that’s not why people find this group detestable (notice he didn’t deny it?). I personally don’t care what the religion or politics are of these people or anyone else for that matter. It’s the intent and actions that speak louder. These people, which include most of the others who have recently spoken out against HeavenFest, aren’t content with just making their case – they have to go into character assassination of the groups they are fighting against or people who may not agree with them. Just look at the rants on their websites (those that haven’t been deleted, that is) and how they talk at City Council meetings. It’s no wonder the two candidates they’ve put up for election (Kaye Fissinger and WIIFL co-founder Richard Juday) were trounced in their run for city council. Yet all you’ll hear is that we just had a low voter turnout – who’s stopping their supporters from voting? Yep, it’s nonsense. Fact is they don’t have the support they think they do – they’re screwballs in the eyes of most normal, rational people in the city. So, remember, laugh when you hear them say “this has nothing to do with religion”. Or better yet, make a drinking game out of it!